It is probably safe to say that Ben Affleck is shaping up to be a better writer and director than he ever was an actor. This is no slag on his acting chops either. Affleck is making much better choices as a filmmaker than he ever did as a performer. His directorial debut, Gone Baby Gone was a tight, thrilling drama and that trend continues with The Town. The Town is a very well-made drama wrapped around a thrilling heist movie. Affleck shows his patience and skill behind the camera, building tension and character drama very nicely. The action scenes and criminal elements feel true to life and are gripping. Affleck uses the camera to build sequences of tightly paced action. The film feels authentic and the Boston setting gives everything a raw feeling. 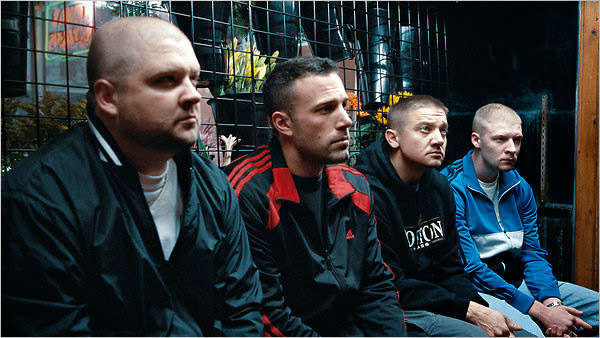 Affleck populates the film with a very talented cast. Jeremy Renner (The Hurt Locker) delivers the most convincing performance as a hardened career criminal that lives and breathes everything Charlestown, Massachusetts. Affleck, himself, gives a reserved, mannered performance. Jon Hamm (Mad Men) looks entirely out of place without a drink and cigarette and not in the 1960s, but does a nice turn as an FBI agent. Hamm blends in, but is kind of lost in the ensemble picture. The biggest surprise is Blake Lively (Gossip Girl), who is completely unrecognizable as a trashy townie, giving an incredibly nuanced portrayal. Chris Cooper in his lone scene as Affleck's father is haunting to watch. The story feels conventional even including a doomed, Stockholm syndrome style love story between Affleck and the very talented Rebecca Hall (Vicky Cristina Barelona). However, through stellar direction and acting, the audience is hanging from every scene. The editing adds to the strong momentum of the film from scene to scene, letting the drama unfold on screen naturally. The Town could have easily been a paint by numbers film in lesser hands but Affleck controls the everything on screen so well. The Town is an ode to the mid-budget, studio action drama not often made anymore. Affleck has produced another strong effort that is imminently watchable. The slow, subtle pace, and drama is carefully crafted as The Town is a solid, old fashioned adult drama and firecracker heist movie of the most sophisticated variety.